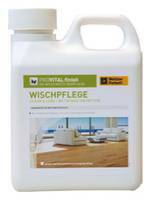 The cleaning and care products from Weitzer Parkett are perfectly adapted to parquet surfaces and are more suitable than other products. Your parquet will stay beautiful for a lifetime. Biodegradable WP is a top-quality, highly concentrated cleaning soap. It is based on natural vegetable oils and has no artificial colours or fragrance additives. Suitable for routine cleaning of all Weitzer Parkett surfaces. 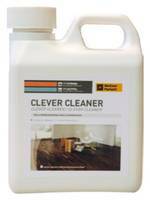 Biodegradable Clever Cleaner is a specially formulated, concentrated cleaner for maintenance-free parquet. Revilatises the surface and makes it dirt-resistant. Easy to use. Simply maintenance-free. ProVital Clean & Care is a water-based, solvent- free product and a highly-concentrated, biodegradable mopping-water additive. It is made of natural soaps and wash-active and nurturing substances that are pH-neutral and environmentally friendly. 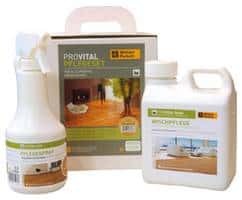 For quick, moist cleaning of all wooden floors with a ProVital Finish surface. Also suitable for furniture and other interior woods. Cleans gently and thoroughly without causing polish haze or streaks. Revitalises surfaces and makes them dirt-resistant. Easy to use. ProVital maintenance spray is used for ongoing care and cleaning of all ProVital surfaces. It is designed to enhance and revitalise fatigued and dull floors. Important ingredients include natural raw materials such as carnauba waxes, paraffin and water- repellent additives. Available in different colour tones. Healthy, breathable and easy to use. 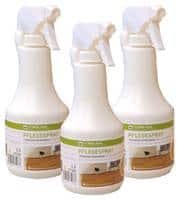 Care spray, wash care and cleaning wipes for perfect cleaning and maintenance of your healthy parquet – all in a convenient set.